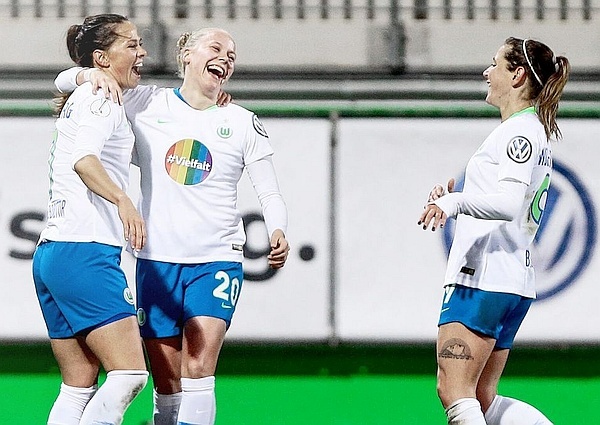 As part of their ongoing “Diversity Week” efforts, VFL Wolfsburg is continuing to build representation and fight homophobia within the German Bundesliga (German National Soccer League) by becoming the first Bundesliga team to wear rainbow jerseys during a regular season match. Inspired by Altrincham FC who is the first professional soccer to wear rainbow jerseys in Europe. The VFL Wolfsburg women’s team wore the jerseys during their match on March 13th with the men’s team wearing theirs during a match on Saturday, March 16th. The original plan was for the jersey numbers to be rainbow (Similar to the US Men’s and Women’s National Soccer Team). However, the DFL (Deutsche Football League which includes the Bundesliga) requires the numbers to be black. Instead, the team’s sponsor VW waived its requirement for the VW logo to remain on the chest so that the rainbow #Viefalt logo could take its place. VFL Wolfsburg is leading the fight against homophobia within soccer by being the first Bundesliga team to sponsor Diversity Week, wear rainbow jerseys and encourage the team captains to wear rainbow armbands. These efforts complement former Bundesliga player Thomas Hitzlsperger who serves as Diversity Ambassador for the DFL and is fighting homophobia in sports.